REAR BUMPER APPLIQUE, DARK CHERRY PEARL METALLIC, CARPETED FLOOR MATS, CARGO TRAY, CARGO NET, CARGO MAT, BEIGE, SEAT TRIM, Warning features -inc: parking brake on, key-operated chime, driver seatbelt reminder, low washer fluid, Vehicle stability management (VSM), Variable intermittent front windshield wipers w/jet washers. 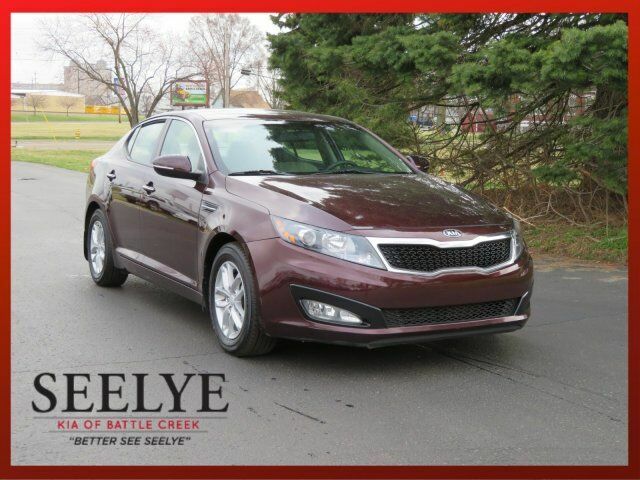 This Kia Optima has a powerful Gas I4 2.4L/144 engine powering this Automatic transmission. Trip computer -inc: distance to empty, average speed, drive time, ambient temp, average fuel economy, instant fuel economy, Towing & lashing hook *Only present on vehicles produced in Hwasung, South Korea*, Tire pressure monitoring system (TPMS), Tire mobility kit, Time-delay interior dome lamp -inc: auto interior light control, Tilt/telescopic 3-spoke steering wheel w/audio controls -inc: wheel-mounted Bluetooth controls w/voice activation button, ECO switch, illuminated ignition, Steering wheel-mounted auto cruise control, Solar glass windshield w/sunband, Side-impact door beams, Remote keyless entry w/panic & alarm function, security indicator, Rear window defroster w/timer, Rear LED high-mounted stop lamp, Rear coat hook, Rear child safety door locks, Rear center armrest w/cupholder, Pwr windows -inc: driver one-touch auto down, Pwr vented front & solid rear disc brakes, Pwr door locks -inc: front central locking, auto unlock, driver two-turn unlock, drill-protected lock, Plastic door sill scuff plates, P205/65R16 tires. IIHS Top Safety Pick, KBB.com 10 Best Late-Model Used Cars Under $15,000, KBB.com 10 Best New Sedans Under $25,000. As reported by KBB.com: If you're looking for a fuel-efficient family sedan that isn't easily lost in a crowded parking lot, the 2013 Kia Optima is it. Combining stunning styling with an affordable price and an unbeatable warranty, the 2013 Kia Optima goes beyond the basic family sedan in features, performance and resale value.